So the Independent – which 30 years ago had set out its stall as the UK’s only independent newspaper – shuts down on March 20th. On Friday I filed my four final columns for the paper with an air of great sadness. 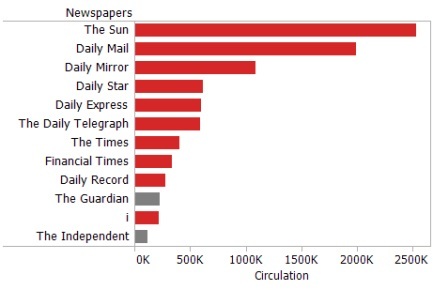 We have (I think) eleven national newspapers, the majority of which are right-wing. But print-newspapers are dying, bought mainly by older people and those who don’t travel with e-devices. We know that each has its market, that the Sun and similar papers are bought by a blue-collar demographic, the Telegraph by non-city dwellers, and so on, but the majority now get their information online. But where do we get it? Of the newsmakers who also have a print-edition I read the NYT, the Independent, the Guardian, the New Yorker, the Spectator and several others – but that’s not my majority reading anymore. Al-Jazeera, the BBC, Londonist, Daily Beast, Mashable, Metacritic, Arts Desk, Cinemascope, Slate, Goodreads, Crimetime and a million others spring to mind. In other words, if I want a specific – a book review, a historical article, a piece on London politics – I’ll go to a site that specialises in just one subject, not to a time-pressed newspaper that may or may not have managed to include it in their pages. If I want to know about a film, I’ll go to a specialised site, not to the Sunday Times, where neither of their main reviewers are actually real critics with credentials in cinema. Roger Ebert had written films – that was what made him a good reviewer. The graph above is deceiving. 3 of the 5 top-selling titles are ‘back pocket papers’ – ie. they sell to van drivers, plumbers, cash-in-hand workers, people who are not regarded by companies as relevant to their marketing plans, and a friend of mine at the Mail says the paper appeals to technophobic older females who are not ‘decision-makers’. Harsh, but that’s how she sees it. So we read online. But availability of online material is US-skewed – too much so, because we share a common language. I’ve lost count of the times I’ve searched for a particular subject and been led to a Hollywood movie covering it instead of an academic article, because the popularity is click-driven. But the days of one-size-fits-all journalism no longer suits our lives. It doesn’t mean we’ll lose fine writing, either because there’s a lot of superb writing online. The big problem remains – how do you get people to pay for the information someone has worked hard to provide? I have just two online subscriptions. If I subscribed to everything I liked I’d not only be broke, I’d be inundated with information and communications. Newspapers are less proactive – you pick them up, put them down and nobody has data-trawled anything. Your newspaper won’t be calling you in an hour to ask how you enjoyed the experience. But their day is – for better or worse – coming quickly to an end. I do a fair amount of research in nineteenth and early twentieth century newspapers, both local and national. What was then considered news and the coverage of news was vastly more extensive, detailed and factual than anything I see nowadays. I guess one of the factors may have been that newspapers were the radio and television and internet of their era(s). Whatever the reason, they are a wonderful window into what was happening and a magnificent source of information. So much of what now passes for news is really opinion. Even the New York Times, which I admire and enjoy greatly and have delivered to my doorstep every morning, seems to be going very tabloidy, if there is such a word. I wonder what those a century or so hence will think of today’s news media content, assuming that anything electronic will either survive or be accessible then. I am feeling in a state of limbo – not sure what I’ll do without a daily Independent. I do also usually check BBC News to see if anything has happened overnight, but would be interested to know how one gets to know about other websites. Word of mouth? I have never heard of 8 out of the 11 sites mentioned – let alone have a million others springing to mind. I realise I am probably not in the right age bracket, though I wouldn’t call myself a technophobe, but my concern is that on-line reading only narrows one’s range. Of course, I could counter that argument by admitting that reading a newspaper doesn’t broaden the mind if it’s The Sun or the Mail. I agree, Vivienne. I am still reading the local paper my parents took, but it is not long for this world, I know. I don’t read on-line except specific items recommended by others, especially now that my eyes are tired by the brightness. On-line is inevitable, I suppose, but we have to be prepared to pay. A suggestion: you could be offered a subscription that would give you unlimited access or a per use charge based on how long you read. Something along that line would have to be the solution because people who just want the Independent for Chris’ column would want to pay a whole subscription cost. Fast readers would get off more lightly than slow ones of course, but average reading speed could be worked out with a factor built in for encouraging reading something else and eventually reaching the subscription level (naturally). How will I light the fire ?? Oh, we like lots of recommendations here, Vincent, bring e’m on with thanks from Admin! I’ll second that, thanks Vincent. The reason for the lack of papers is that they stopped paying the writers, stopped sending journalists out, and went for the quick buck in the 70’s & 80’s as so lost the long game. The problem with online is finding it, a paper in a shop or advertised on a shop is also a prominent advertisement and should be seen as such, online only has a main problem it’s hard to keep noticed. And then we have The New day due to be published, and The I being sold off. interesting to see if a quality compact will fly. Your best bet Vivienne, is Drudgereport.com this is an US aggregator site with links to a wide variety of english language news sites. The site itself leans to the US right, but the list of links are handy. I have tinkered about, finding the exact syntax was a bit tricky but, here it is. It looks for the exact phrase in quotation marks on only those 4 websites and nowhere else. Have a play with it, the | is called a ‘pipe’ and can be hard to find on the keyboard, on mine it is [Shift+\] change the sites for the ones that best suit what you are looking for. Be very careful with the punctuation and spaces too many or not enough it breaks. Once you have it just as you want it, save it as a bookmark with a suitable title like “DVD Finder” or what ever you have customised it to do. And the next time you want to use it just change the words between the quotes. News is its own worst enemy – when news organisations gave up finding things out for themselves and defaulted to regurgitating media releases, they lost credibility and began promoting a business-leaning, personality-leaning right-leaning agenda even if they tried to avoid that. There have been earlier comments on the blog about absence of fact checking but the lack of facts in a media escape from the emitting (or is that ‘vomiting’?) body is never challenged. Ed Murrow [almost] said that when news became a profit centre, it became entertainment instead of information. Specialist correspondents rarely have specialist knowledge, unable to tell fantasy from bull from deceit from the occasional escaping nugget of truth; ‘specialist’ correspondents move on like government ministers on their respective merry-go-rounds. My ‘spare time specialism’ is passenger transport and I weep regularly at the tosh media outlets repeat instead of asking questions. We have the media we deserve, someone will argue – I couldn’t agree but it’s hard to justify disagreeing. Joel, my father went missing at age 3 1/2 in 1916. He was gone over night but was found the next morning by a sewing machine salesman. My grandmother kept the newspaper article and when I read it recently I found the family name spelled differently each time and not correctly once. I haven’t checked to see if they got the address correct. Fact checking didn’t even extend to consistency. McSavaney isn’t that difficult to spell.